New: At Last! 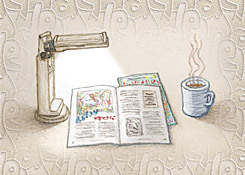 For several years I've been trying to find a simpler, convenient way to create and post online several magazine articles and interviews that belong here as additional resources. I was granted the permission by several interviewers and editors to create web versions of some of my own "classic" interviews. But the chore of scanning each page and then using OSR conversion software to come up with text files, and finally interposing higher res images for the photos, graphs, scores and diagrams similar to the original pages, made the task look punishing indeed. Or at any rate, it would have taken far more time and effort than I could afford to spend on the venture. Also, while interposing original images with new html text does give an idea of the original layout, there's nothing quite like seeing the actual pages of the magazine themselves, is there, especially when the images are all cleaned and tweaked to look "better than new?" So here's what we've got for you, to read in your browser directly, or download for printing and saving. The most requested files have been for the classic Keyboard and other magazine interviews. Okay, to start with, how about the pair of Keyboard Magazine interviews Bob Moog did with me, right after completing my score to TRON? Then there's a fine interview with Jim Aikin for a new short-lived magazine on computers for music making, the topic being those very timely issues. And one for FilmScore Monthly, about (surprise) most of my filmscore work. "New Directions for a Synthesizer Pioneer"
Download and/or read this article. If you have problems download this zip file. More about the interview HERE. text at New Music Box -- HERE. the interview in html -- HERE. "Defying Conventions, Discovering New Worlds"
"Soundpage Exhibits from the Butterfly Collection"
"A Guided Tour of Beauty in the Beast"
"A Many-Colored Jungle of Exotic Tunings"
Download and/or read Guided Tour. Download and/or read Exotic Tunings. "Wendy Carlos: In the Moog"
Download and/or read this brochure. "Very Rare George Wright 1964 Interview"
Note: All extant copyright restrictions apply for the original articles, in addition to those for our newly created pdf versions. Also, don't forget there are other vintage interviews and texts available in standard non-pdf format below. 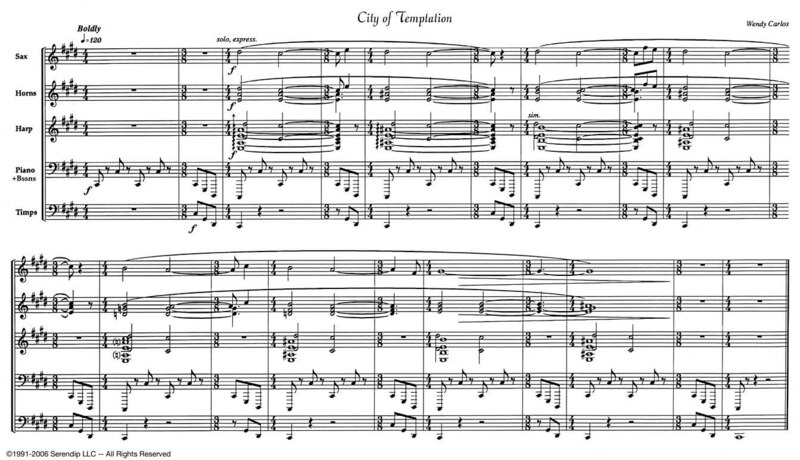 New: Just found score page: While trying to locate something quite different, I came upon my original Finale score page created during the initial composition of "City of Temptation", a featured track on "Tales of Heaven and Hell". It's one of the rare examples of music written in 11/8 meter, which gives it that notable "push" into each new bar. Actually, it turned out to be more helpful to lay it out in the equivalent 4/4 + 3/8 meter pairs for each two adjoining bars, but the sound is eleven beats. It resembles the action music in my score to TRON, which breaks the seven beats into 4 + 3 each 7/8 bar, with a similar asymmetrical effect. The structure is very formal, how the melodic and harmonic lines progress, and the ostinato of the bass lines. Thought you'd enjoy a look-see...! (click for full size scan). DigiPerformer 1.6+/ Performer 5.1+ Format or Standard MIDI Format or .ZIP version of MIDI format file of the music tracks used on S-OB 2000 's Air on a G-String. DigiPerformer 1.6+/ Performer 5.1+ Format or Standard MIDI Format or .ZIP version of MIDI format file of the music tracks used on S-OB 2000 's Two Part Invention in d minor. DigiPerformer 1.6+/ Performer 5.1+ Format or, if necessary, Older Performer 2.41 Format or Standard MIDI Format or .ZIP version of MIDI format file of the MIDI music tracks for The Hummingbird from Carnival of the Animals, Part II. DigiPerformer 1.6+/ Performer 5.1+ Format or, if necessary, Older Performer 2.41 Format or Standard MIDI Format or .ZIP version of MIDI format file of the MIDI music tracks for The Vulture from Carnival of the Animals, Part II. (Weird) Al Yankovic provided the witty poems and narration of the original recording, but MIDI format doesn't currently support spoken humor, alas! Consult the CD for more details. DigiPerformer 1.6+/ Performer 5.1+ Format or, if necessary, Older Performer 2.41 Format or Standard MIDI Format or .ZIP version of MIDI format file of the MIDI music tracks for the opening orchestral section from her parody on Peter and the Wolf, by Prokofiev, pp. 3-5 of the full score, rehearsal #s: 0 &1. DigiPerformer 1.6+/ Performer 5.1+ Format or, if necessary, Older Performer 2.41 Format or Standard MIDI Format or .ZIP version of MIDI format file of the MIDI music tracks for an early orchestral section from her parody on Peter and the Wolf, by Prokofiev, pp. 15-19, rehearsal #s: 11-14. DigiPerformer 1.6+/ Performer 5.1+ Format or, if necessary, Older Performer 2.41 Format or Standard MIDI Format or .ZIP version of MIDI format file of the MIDI music tracks for a large orchestral tutti near the end of her parody on Peter and the Wolf, by Prokofiev, pp. 70-78, rehearsal #s: 48-52. These are Wendy's final performances from the CBS/Sony CD, for you to study or to try your own realization using your own sequencer and MIDI gear. Have fun! (Note: the standard MIDI format omits track assignments, some names, and helpful comments data, unfortunately.) (Weird) Al Yankovic provided the witty narration of the original recording, but MIDI format doesn't currently support spoken humor, alas! Consult the CD for more details. Now you can also see the way a master tuner "lays the bearings" and proceeds to tune all 88 keys. By the way, this file was done without Yeend's being aware of it, using the simply wonderful Gulbransen Orchestra II Pro piano MIDI pickup system. It sits under the keys and has no palpable effect on the instrument, except that it now becomes an excellent, flexible MIDI keyboard controller. With no exaggeration: "it may very likely be the best MIDI controller in the world, given that your piano's action is reasonably good to start with...!" Usage Note: You may examine or work with the above files for your own private use only, as all material is copyright protected, and not in the public domain. You also may use them for music classroom purposes, teaching examples, as long these are for non-profit, provided due credit is given to Wendy Carlos, and you limit yourself to excerpts only. Our only request in the case of instructional usage is that you notify us of your intention via the Write Wendy mail drop for our site. Thanks. "Music and Audio Tool Recommendations"
We regularly receive questions from the many musicians among you about what particular tools Wendy uses, and what she would recommend for others creating music, scores and audio with digital and computer tools. If you haven't already seen it, for several years our site has had some words of praise for Mark of the Unicorn's respected and powerful MIDI and Audio editing package, Digital Performer -- read it HERE. And now we've added a new page about the powerful mono and stereo audio editing software, BIAS's Peak, read about it HERE, and the definitive library of plug-in and stand alone acoustic instrumental resources from Garritan Corp., read about them HERE. "Only Human: Touching the Significance"
Here's the most recent soul-searching interview with Wendy, by the same good Carol Wright mentioned below. Originally a portion of this unusually candid, questioning piece was used in the article "A Simple Thought: Music and Meaning", which ran in the July 2001 issue of New Age Retailer. Carol thought it would be intriguing to place Wendy's pithy observations in the middle of the article, which otherwise represented a more new age, spiritual discussion on inspiration and meaning in art and music. What, Carol wondered, would be the source of Wendy's inspiration, if she didn't believe in a God? With a leadoff like that, you know you're going to discuss a lot of core values -- of music, creativity, humanity -- and they did. "The Digital Phases of Wendy Carlos"
And here's a very recent, expansive and Kaleidoscopic Interview by Carol Wright, written originally for the Synthmuseum magazine for Spring 2001. This wide ranging article covers a lot of questions that many of you have kindly sent to us over several years now, on the music and tools Carlos has used over the years. It also discusses the effects of digital technology on music, and the differences with the earlier analog instruments. We think you won't want to miss this one. "Something Old, Something New: The Definitive Switched-On"
Here's the first interview with Wendy by Carol Wright, which took place in the Fall of 1999, for New Age Voice magazine. Like the title says, this spontaneous chat delves into topics many of you still write and ask us about, the Moog years, the first albums, and now their definitive remastering and collection into the Switched-On Boxed Set. It's here and more. "Tuning In To Wendy Carlos"
This witty Cover-Story article and interview with Wendy by Connor Freff Cochran, first appeared in Electronic Musician magazine in November of 1986. In some ways he got to the real essence of the musician and person with these candid impressions, as they discussed the background that went into her "Beauty in the Beast" album. For those of you who have been requesting that we post some of the more interesting past interviews with Wendy on our site, you ought take a browse at this one before moving on. "The Original Notes to S-OB 2000"
MacWrite Pro Format (original, complete) or Word 5 Format (complete) or Plain Text Format (missing footnotes and formatting) file of the booklet's liner notes for Switched-On Bach 2000, released by Telarc in May of 1992. These are detailed notes and narratives, with historical, musical, technical, and behind-the-scenes information about the way the 1968 S-OB came to be, right through this special 25th Anniversary Version, with Bach's own tunings. A "must read" if you've not seen them before! For even more information on the Moog albums of Bach and Baroque music, particularly about the Moog Synthesizer itself, check out the Switched-On Boxed Set, released in the Fall of 1999 on ESD. We just found this full original transcript of a featured Jim Aikin Interview with Wendy that appeared in the Nov-Dec 1997 issue of Music & Computers magazine, now long gone, alas. (A much shorter edited and printed version is also available in our collection of pdf files, created from page scans of the original publications.) For a short time Miller-Freeman made available web versions of material related to their current issues, including full transcripts of articles which were reduced in length due to print space restrictions. We had saved the full transcript from their site shortly after the interview appeared in print, and set it aside. In searching for something completely different, that file turned up, and has been copied and reworked into a compatible page for our website. It contains quite a bit of conversation on topics not available anywhere else, and we hope you enjoy reading it. Alan Baker interviewed me not too long ago for the excellent American Mavericks radio and internet series about musical individuals and iconoclasts. I was honored to be included with so many good people. Alan was unusually well prepared and knowledgeable about all of the topics that have most interested me over the years: synths and alternative tunings, orchestration, physics and acoustics, musique concrete, and so on... so our easy back and forth headed off into areas I've seldom spoken about before. The interview took place in early 2003, with us on opposite coasts (I was asked to come to the lovely, excellent mini studio located in the rear of Carnegie Hall). Although the American Public Media has had most of their interviews available in both streaming audio (try HERE, if it's still working) and text versions, we're providing this BU online copy of the text version HERE, which you can read online or save to print later, as it is unusually long and involved. (You may want to increase the font size if you read it off a monitor, but it tends to print readably well, and saves paper at this size.) Thank you to everyone involved, Alan especially, for such a respectful, intelligent job! The above two files are the ones I use for my K2000 synths. It was impossible to learn the messages needed over SysEx to change which tuning table was being used. Kurzweil didn't even know. After discovering the secret via a long and devious route, I made the first chart to remind me. Turns out to be fairly straightforward. If you use this excellent series of machines, and want to try some of the other good tunings available, this will make life easier. The second chart shows how to "press keys" on the front panel via MIDI. Both charts are in GIF format, and you can yank copies of either one via your browsing software and save. On my Macs I just drag the screen image directly to the desktop for a quick copy -- your machine may also support that convenient feature. MacWrite II Format or MacWrite 5 Format or MS Word Format or Plain TEXT (no formatting) versions: K2000-to-AIFF Tip Sheet. You can also read it here from your browser. This is a description file for K2000/2500 users who wish to edit their audio files/sample on a Mac audio program. I do this a lot, but kept forgetting all the steps to use when I'd not done it in a while. I've been a purist and kept the SCSI connections for the Mac and K2000s unconnected from each other. So I use floppies to move the aiff format files back and forth. I printed a couple of copies of this file onto thin cardstock, and keep them handy when doing this task. Much quicker than trying to find the information in the manual. Give it a try. MacWrite II Format or MacWrite 5 Format or MS Word Format versions: Alternate Tuning Guide for the K1000, K2000, K2500, and FS 150 Synthesizers. MacWrite II Format or MacWrite 5 Format or MS Word Format versions: Tuning Table for this guide. This small guide book was written as a present for many of my friends at Kurzweil several years ago, and so is directed mainly to the K1000 series. But it's all very easy to use with the newer units, as you'll see when you read it. And it's easy enough to adapt to other brands of synth as well. Basically this guide is also a mini-history of how some of these fresh sounding alternatives to the standard 12-tone Equal Temperament came about, and how to use them. The guide itself is available above in several formats. Since the TEXT version can't suppont all the formatting, nor the imbedded images, I've not included it here. MacWrite Pro Format or MacWrite 5 Format or MS Word Format or Plain TEXT (no formatting) versions: Three Asymmetric Divisions of the Octave. You can also read it here from your browser. This is an article that appeared in an issue of PITCH, published by the American Festival of Microtonal Music. Here's a short article I was commissioned to write for this excellent journal of microtonal resources. It's a non-general text explaining Asymmetrical tunings, which I discovered in 1984-85. The three most important versions are described, and suggested ways to use them is given. Never before reprinted, this file is thanks to Johnny Reinhard, who was able to locate copies of the original files, thought lost. For copyright reasons I can't place the original articles up on this site, of course. It will probably be sufficient to describe them to you in brief. The first article described the world of contemporary serious classical music as having been torn in two for much of the 20th century. One side embraced the Schoenberg methods of Serialism, and had major influence on most of the music produced since at least WW II: a consciously structured music that deliberately avoided suggestions of tonal basis, in any harmonic or melodic sense. Some serialists also dissolved expectations of rhythm and meter and structure. If you ever attended a concert of so-called "Modern Music", you will know what it sounds like: astringent, restrained and difficult to follow, even when you know the system. It's mostly quite ugly acoustically, and difficult to recall in any detail as you leave the hall. The other side refused these notions, and so consisted essentially of all other forms of serious music, from the most conservative, to the most experimental, as long as some tonality was maintained, and the methods of the Serialists were not. I was and still am a member of this latter group. Every musician who has not felt -- we do not say understood, but indeed felt -- the necessity of the Serial language is USELESS." It was rough to hear such attitudes expressed, and subtler similar ones of dismissal, and it grossly affected most of us negatively, those of us who were on the other side, like it or no. The short letter makes a point that some serial music was not so deadening to hear, being based more on the ideas of Bartok and Berg. While the second article discusses ways that Serialism may be experiencing pressures today not unlike the tearing down of the Berlin Wall -- a newer generation that refuses to go along with its well-worn methods, and is striking out into more tonal and original directions. I try to cover these ideas in my letter, including observations of the personal difficulties of survival, being a composition student in most music colleges and universities during the heydays of rigid serialism. Perhaps these pressures drove me and many others since into the worlds of the synthesizer and computer. DigiPerformer 1.6+/ Performer 5.1+ Format or Standard MIDI Format or .ZIP version of MIDI format and a PICT image (of the contents and placement of the System Exclusive Data on the tracks) for changing the tuning of several synths! These are files that have been requested by several of you who share my interest in alternative tunings. Since it really is quite time consuming to make custom tables for many synths, here's a good starting place. The sequencer file (open one of the two versions for a look), whose track layout is depicted in the PICT image above, contains the tuning data I currently use on the Yamaha TX802, the Yamaha SY77, and the Kurzweil K2000/2500 synths. Track one is just a place-holding "conductor" track. Track two contains the long System Exclusive message that you can send to burn a Cartridge in the TX802 cartridge slot. The cartridge will then conveniently contain all tuning tables in this PICT image. You can just go into the Performance Edit Menu, choose "mtt#", and from there, in "PERF.EDIT6", select the Micro Tuning Cartridge, with the number chosen to match the desired tuning. Makes this one of the easiest synths for using a lot of alternative tunings, except that there is minimal alpha support, so you have to refer to the tunings by their number, not name. I hate to think of how many hours it took to make these tables, or even to locate the files, make these edited and cleaned-up copies and images, double check their contents, and then try to explain them a little here for those of you who are interested. I'm sorry that I can't instruct you completely what to do to use the above files. I assume you already have an idea -- a working knowledge of SysEx and the use of sequencers and synth editing. The first is in Mark of the Unicorn's Performer (or Digital Performer) usual format. The second is saved as a standard type one MIDI file. You may have to refer to the manuals for your given synth to work out the other steps. Since many of you already know how to do it, these files could be of genuine help to you. Good luck with them, and enjoy hearing what we've been missing for far too many years! A sign over a fireplace mantle in New Hampshire has this puzzle on it. I saw it in a charming old Inn while having dinner with friends in the late '70's, and it caught my eye. The last line seemed clear enough, but how about the rest? So I scribbled it down, and when I got home tried to figure it out. Turned out that the terminology was kind of archaic, but then it was a puzzle from some word-playing "Yankee" made up over a hundred years ago. At first it's harder than it looks. Eventually it dawns on you what it's all about. Simple stuff, and kind of corny, too. Think of where the sign is located, near the grate of a roaring fireplace, where strangers might have helped out fueling the flames-- IF they knew their English! I suppose this is a ridiculous thing to put up here, especially since I'm not giving the answer ("Ooo -- she's mean, that one!"). Quite a few of our friends have doped it out, though, and once you do, you can spring it on the boastful "puzzle solvers" in your group. Hang it on the wall, smile, and then be prepared to duck...! Postus Scriptuswise: It seems that the Gold Leaf awards (for the sole Moog note in S-OB 2K) located at the top of the currently most recent Open Letter have inspired a loyal fan to solve this word-play puzzle, and to send me his solution. His sole "fluff" was so inconsequential, one word, and his spirited solution was so much fun to read, I thought I'd add his name here, with a special Neo-Gold Leaf. So CONGRATULATIONS to Todd M. Curro, who gives as his addresses, Massachusetts and South Korea. You're the first person to have done this, too -- plenty of reason to add your name right here, hey! And another CONGRATULATIONS to Ian Kemmish, who lives in England. I never planned on this small section of the Resource Page to contain another contest (like the one Moog note one, which always appears at the top of the newest Open Letter). TMike Stubbs & Zack Turpin of "wavingpalms", Peter Holliday (who has been an interesting music correspondent, too), and David Harris, another savvy solver from the UK. All of you got the exact (or for Stubbs and Turpin, a very nearly exact) translation, good work! Recently a good friend was enthusiastically about to commence his first professional set of recording sessions (you know who you are...!) In my usual helpful, supportive, but ever malicious way, I decided to jot down a series of "Helpful Tips for the Novice Recording Engineer", and send it to him. With tongue firmly in cheek, here is the nasty parody that resulted. 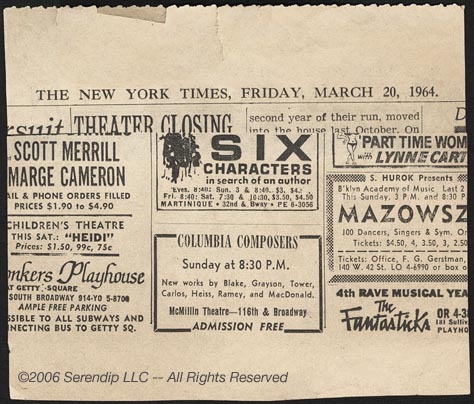 While searching through an old file cabinet for some Moog information sheets to post on our site, I also discovered a tiny newspaper clipping from my days at Columbia University, as a graduate student in the Music Department. That's where I met Vladimir Ussachevsky, the electroacoustic music pioneer, as well as other notable professors, like composers Jack Beeson and Otto Luening. For years the music department organized free concerts of music written by student composers in the department, and they called them: "The Columbia Composers." This series had faded away by the time I arrived in the early 60s. In it's place were several other concert series of new music. Alas, the only place for the graduate student composer was within the new program by "The Group For Contemporary Music at Columbia University." They seemed to offer ONLY dodecaphonic, or serial, atonal fare, and other quite severe, generally ugly styles. Mixed in with the clipping above, I also found this single sheet with my scrawled figures of what it would cost to build a small new studio. It dates from somewhat over a year after that clipping, when I had finally graduated. I considered trying to set up a few new devices on my own, much like Ussachevsky's small McMillin Room #106, where I had done most of my electroacoustic composing while studying for my MA. Perhaps I could collect and hand-wire some equipment slowly for my new studio apartment, while I continued to work as an audio engineer for Gotham Recording Corp. on West 46th Street. Down below the first three Ampex preamplifiers you can make out two smaller rack panels. The lowest one is a very simple passive mixer, which allows one to hear any blend of the tracks while overdubbing, with no need of a console. Just above that is a homemade Sel-Sync panel. That's Ampex's term for a box included on most of their multitrack tape machines which lets the engineer use the record head, instead of the normal playback head, to hear existing tracks, while the new overdub recordings are made. Being all in the same place along the tape, this allows the performer to record the new parts in exact synchronization with the already recorded tracks, thus the name. But Ampex had very few 8-track Sel Sync boxes in the mid-late 60s, and they were hard to get and very expensive. I knew I could build something that would work about as well, and did so. A professionally engraved front panel makes it look surprisingly pro. 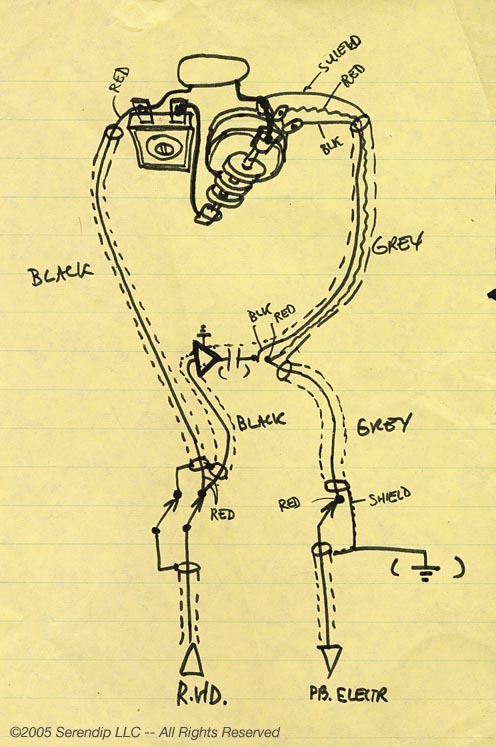 The parts were bought in town, as was the custom ordered stacked 8-track head assembly from IEM. For transforming the record head's outputs into something more resembling a PB head's signal (also filtering off any tape-bias leakage), I was going to use a tiny transistor preamp for each track. Here's the first draft idea, before getting some advice from Bob Moog. Sadly, the final prototype created more problems with noise than it solved, so I ended up with a passive circuit, which had no gain but added no hiss or hum, either. With that you had to readjust the playback level control for each Sel-Synced track, turn them back for normal PB, that was the tradeoff. 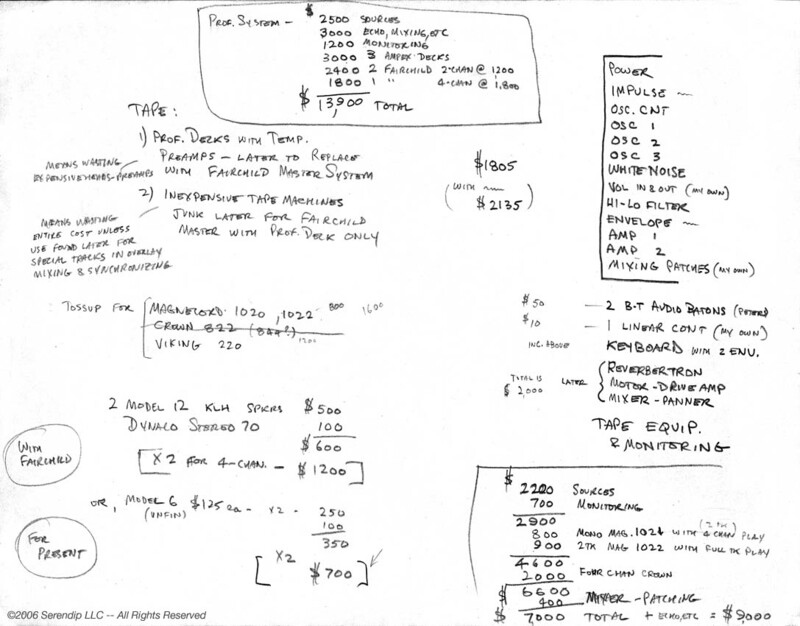 This small hand-drawn schematic on yellow paper from a legal pad is all that's left of a reasonable idea that didn't work out. I've been using the Dvorak Keyboard layout since 1986. It was a surprise when Apple, who originally had made the simplified keyboard a mere button press on the Apple IIe, IIc and IIc+ abandoned it on the Mac. But with ResEdit and Fedit, I discovered where the "asdf..." table was located in the system, and carefully changed it to the Dvorak configuration. One neat trick is to use press-on letters on the keytops, then put a couple of coats of clear nail enamel over them, buffed with fine steel wool (most keyboards have different angles for the tops of keys on each row, so you can't just move them around to a new layout, or it looks messy). I've also seen adhesive key tops in thin plastic with the appropriate letterings. Originally each new Mac System update had to be edited to change the keyboard layout. But with the Mac's System 7, it became a lot easier to install Dvorak. You need only an appropriate KCHR resource. (It's similar for Windows machines.) So I hacked the US-qwerty KCHR resource so all the shift and option combinations matched consistently, and this is the one I now use. (Double-click open the System itself, drag this KCHR inside, and close. Then select Dvorak from the Keyboard Control Panel.) You may want to give it a try. Very recommended!